This board is 5V compliant - a 3.3V regulator and a i2c level shifter circuit is included so you can use this sensor safely with 5V logic and power. Using the sensor is easy. 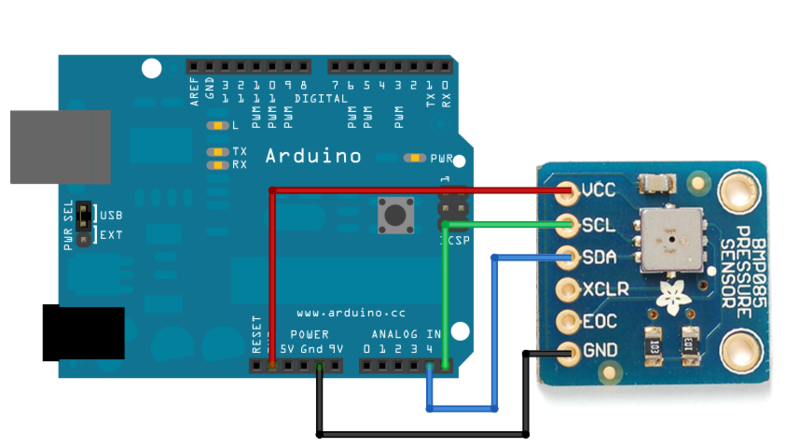 For example, if you're using an Arduino, simply connect the VIN pin to the 5V voltage pin, GND to ground, SCL to I2C Clock (Analog 5) and SDA to I2C Data (Analog 4). Then download our BMP085/BMP180 Arduino library and example code for temperature, pressure and altitude calculation. Install the library, and load the example sketch. Immediately you'll have precision temperature, pressure and altitude data. Our detailed tutorial has all the info you need including links to software and installation instructions. It includes more information about the BMP180 so you can understand the sensor in depth including how to properly calculate altitude based on sea-level barometric pressure. 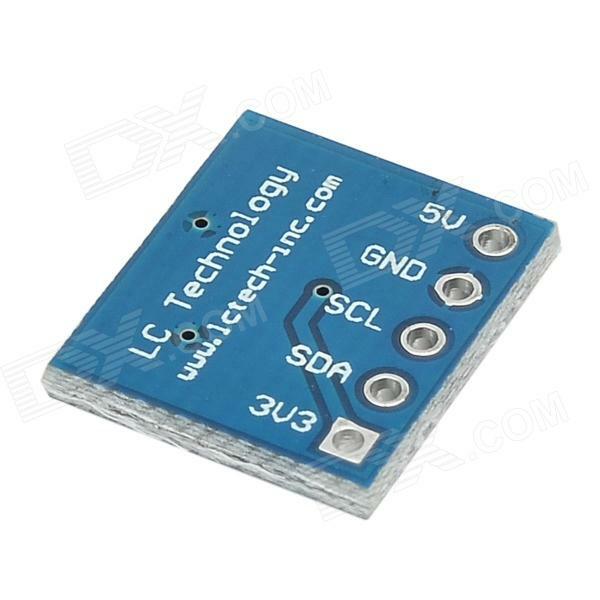 Since the BMP085 is a i2c sensor, its very easy to wire up. We'll be using an Arduino as an example but any microcontroller with i2c can be used. Connect the VCC pin to a 3.3V power source. 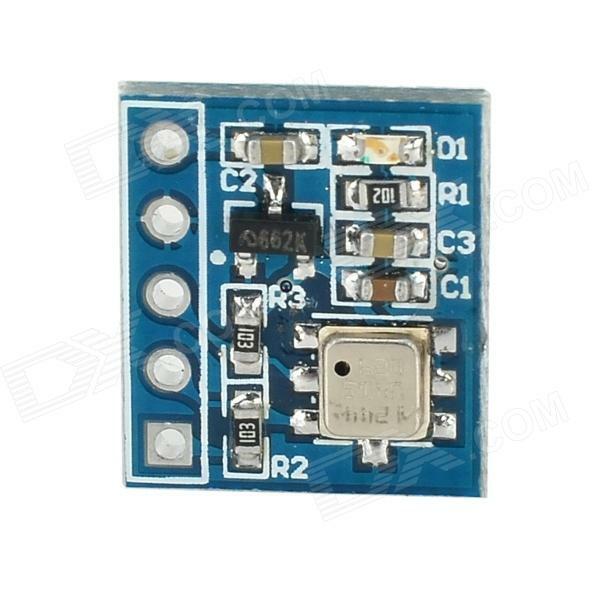 The V1 of the sensor breakout cannot be used with anything higher than 3.3V so don't use a 5V supply! 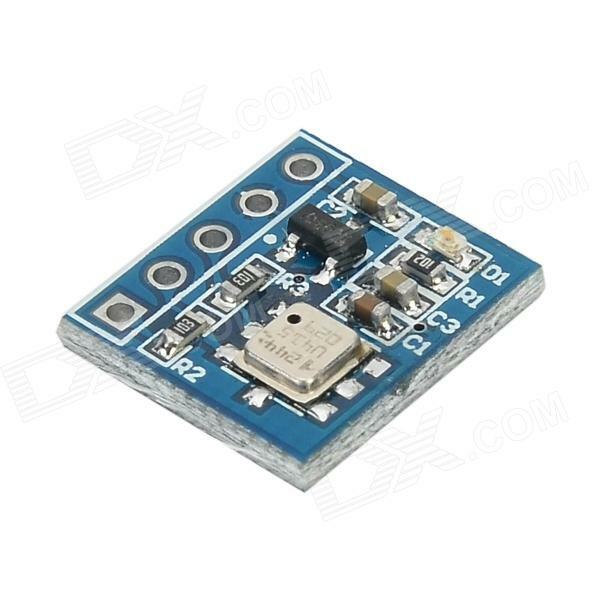 V2 of the sensor board has a 3.3V regulator so you can connect it to either 3.3V or 5V if you do not have 3V available. Connect GND to the ground pin. Unfortunately, the i2c lines on most microcontrollers are fixed so you're going to have to stick with those pins. You don't need to connect the XCLR (reset) or EOC (end-of-conversion) pins. If you need to speed up your conversion time, you can use the EOC as a indicator - in our code we just hang out and wait the maximum time possible. This page is based on the new v2 of the BMP085 driver, which uses Adafruit's new Unified Sensor Driver. The driver provides better support for altitude calculations, and makes it easy to switch between the BMP085 and any other supported pressure sensor in your projects. If you haven't already done so, you'll need to install the Adafrut_Sensor library on your system as well, since Adafruit_BMP085 relies on this library to generate the sensor data in a universal manner. Install the library Adafruit_Sensor-master, Adafruit_BMP085_Unified-master. The data above is reasonably close to what I'd expect at my location, but we can improve the accuracy by changing the reference sea level pressure, which will change depending on the weather conditions. Every 1 hPa that we are off on the sea level pressure equals about 8.5 m of error in the altitude calculations!